The NEEM Model #112 is an extremely easy to use, sensor-to-Internet interface unit that allows users to rapidly connect common types of sensors directly to the Internet without the need for an intermediate PC unit. The NEEM Model #112 includes a complete, ready-to-use, highly integrated set of hardware and software tools to provide self-documenting, Internet-accessible sensor data acquisition, data logging, and data display to transform conventional sensors into smart sensors. The technology underlying the NEEM-112 is modeled after the IEEE 1451.2 Smart Transducer Interface standard. Single Ended Mode - Input Signal Must be Between 0 and +5 volts. Measurement Must Be Referenced to Ground. That is the low side of the signal must be connected to ground. 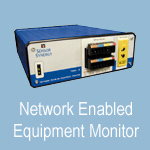 4 - 20 milliAmp Analog Signal Monitor - Electrical isolation provided by optoelectronic isolator. High and low side isolated. Maximum peak current must be below 40 milliamps, maximum reverse voltage should be less than 2.5 volts. Absolute voltage must be between 0.05 and +3.5 volts. No negative voltage relative to system ground is allowed on this channel. Differential operating mode, the measurement reflects the difference between the voltage on the two connections. Neither side must be connected to ground. Suitable for bridge circuit applications such as common strain gage circuit configurations. Input Signals Must be Between 0 and + 5 volts. Difference in Signal Voltage Must be Between -2.5 volts and +2.5 volts. Single Ended Bipolar Mode - Input Signal Must be Between -10 volts and +10 volts. Measurement Must Be Referenced to Ground. That is the low side of the signal must be connected to ground. In the Continuous Mode counting resumes with last counted value when power to the NEEM unit is cycled off and then on again. Signal Must be a Pulse from 0 to +5 volts (TTL Level Pulses). - Minimum pulse width is 1.0 microseconds. Event counter voltage signal high level must be greater than 2.5 volts to be recorded as a count. Thermocouple Signal - Thermocouple Signal must Not be Referenced to Ground. Neither the plus side or the minus side of the thermocouple signal should be directly connected to ground. No common mode voltage should be present on this signal. Silicon diode type of temperature sensor on the NEEM circuit board provides the temperature in degrees Celsius for one area of the main circuit board. Internal Temperature - This sensor is internally connected to provide a coarse measure of the NEEM-1112 circuit board temperature. No user connection allowed for this channel. Monitors “dry” switch contacts – 5 volts and 1 milliamp sense current. “Low –side” electrical contact connected directly to system ground. Monitors the state of a dry contact switch. In the open state, the switch must stand-off 5 volts. In the closed state, the switch must conduct 1 milliamp of current. Control Output Signal - O volts or 5 volts output. Output signal will supply up to 1 milliamp at 4.5 to 5.0 volts and will sink up to 1 milliamp at 0 to 0.5 volts. Standard NEEM product is available in a 6.8” (172mm) x 8.2” (208mm) x 2.3” (58mm) enclosure made from extruded Aluminum with a blue powder coat finish. Sensor data acquired by the “Primary Sensor” interface channel is stored by the NEEM unit in non-volatile memory. The “Primary Sensor” is designated during the NEEM setup process using the Configuration Console. Information from the Primary Sensor is continuously sampled and recorded at approximately 20 second intervals as long as power is connected to the NEEM unit. 20 second intervals, continuously stored for 1 year for the Primary Sensor only. 15 minute average values calculated from the Detailed Measured Data are continuously stored for 1500 days (approximately 4 years). 15 minute average threshold comparison data is calculated as a percent of time that the measured sensor signal satisfied the threshold condition during a 15 minute period. This value is calculated from the Detailed Measured Data values and the Threshold information and the threshold inequality condition entered by the user during the setup process using the Configuration Console program. This information is stored for approximately 4 years before the oldest data is over-written with new data. Daily average values indicating the percent of the day that the primary sensor values satisfied the threshold condition. This value is provided as a percentage value indicating the percentage of the normal workday that the Primary Sensor data satisfied the threshold condition. The hours in the day during defining the normal workday for an application is setup in the Configuration Console under the “Work Week” tab. This is necessary so that the average values calculated can exclude shutdown periods. The user can include all 24 hours a day, 7-days a week or exclude various periods based on the specific needs. This information can be particularly useful when determining the fraction of the workday that a resource is in use. This feature can also be used to determine the fraction of the workday that a piece of equipment is in an alarm mode.This information is stored for approximately 10 years.